Transformer oil purification plant CMM-2,2 is designed for removal of solids and thermo-vacuum purification from water and gases of lubricant and electric insulation oil with viscosity of no more than 70 cSt at 50C. The unit may be used for heating of oil filled electric equipment with hot transformer oil, vacuum drying of transformers and evacuation or transformers. 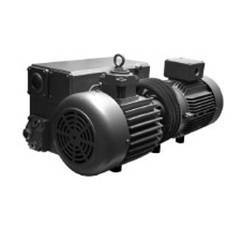 The unit is designed for installation, repair and operation organizations which process transformer oil. The unit is not designed for operation in explosion hazard areas, as well as in toxic or chemically aggressive environments. When using the unit indoors, ensure safe exhaust of gases into the atmosphere by pipelines. The unit is a container with all components and assemblies inside. The side walls of the container feature hatches for access and servicing. 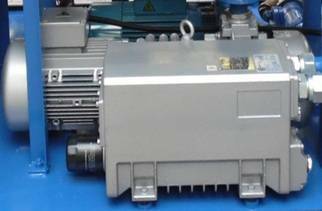 The unit consists of the following components: vacuum chamber 1, input pump 2, heater 5, output pump 3, fine and coarse filter cartridges 6, control cabinet 8, pipelines and valves. Process parameters are managed by Mitsubishi α2 controller base on: TCM type temperature sensor, ТС-2 thermostat, flow relay, Suco vacuum relay, ЕС 3016 РРАSL level sensors, VP02E foaming sensor, М1, М2, М3 manometers for visual control of pressure on filters and vacuum meter VM for control of vacuum in the vacuum chamber. A mesh filter at the unit’s inlet removes solid particles from the oil. Fineness of filtration is defined by the 200 micron brass mesh secured in the filter’s case. To rinse the filter element, remove it from the inlet and rinse in clean transformer oil. 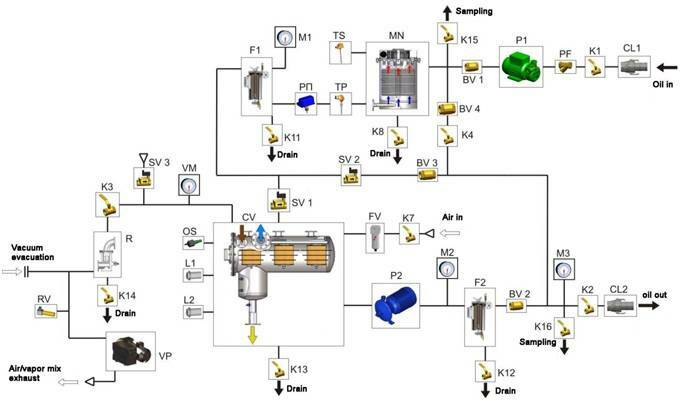 The pumps Calpeda type NM 2 and 3 input and output oil to and from the unit respectively. The pumps are controlled from the control panel. Fine and coarse cartridge filters remove solids from processed oil. Filtration fineness are 5 and 25 micron respectively. 1 – oil inlet; 2 – filtered oil outlet; 3 – contaminant drain valve; 4 – filtering element; 5 – air release valve; 6 – magnets; 7 – hold down screw The device consists of lid and frame, which supports FE-16, FE-28 type filtering element. The lid is equipped with a valve which allows to release air from the filter when it is filled with oil and to let air in when the oil is drained form the filter. Oil inlet and outlet are welded to the case. The replace filtering elements (cartridges), drain contaminants from the filter by opening the valve 3. Turn the handle 7 of the pressing screw several turns counter-clockwise, turn the lid’s stock in the same direction against stop, then remove the lid from the filter, unscrew the hold down nut and remove filtering element. Install the new cartridge, secure it with the hold down nut. Install the lid back on to the filter by repeating the steps above in reverse order. 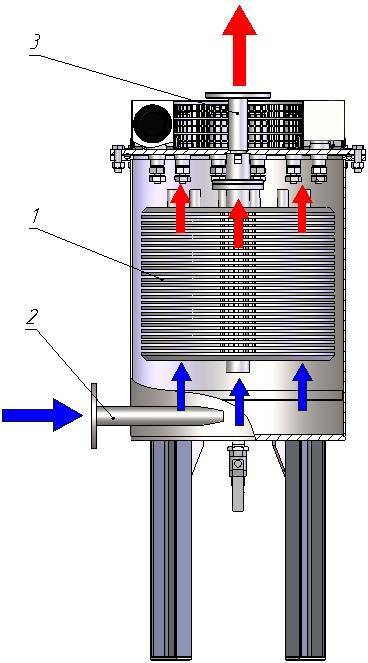 The heater is a vessel with a total of 53 kW heating element. The heater is equipped with input and output lines and a drain valve. 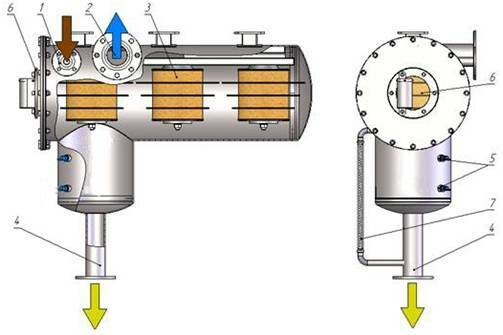 Refer to Figure 4.4 for general view of the heater. The heater is controlled from the control panel. Oil temperature is controlled by the temperature controller, which receives signals from thermistor TP, and thermostat TS (see Fig. 4.7) An interlock flow relay prevents heater operation with no oil flow to protect the heater from damage. The vacuum chamber 1 is designed for thermal vacuum drying of transformer oil. Ball valve K3 is attached to the column for connection to the vacuum system, as well as vacuum meter VM, level sensors L1 – L2, a visual oil level control indicator and foam sensor OS. 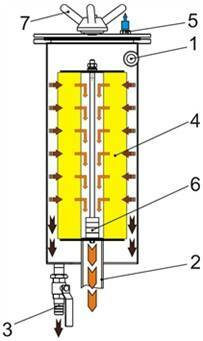 The oil enters the column through the inlet, then flows to the activator filter and the outlet. The design of the sprayer facilitates intensive emission of gas and water from the oil during processing. 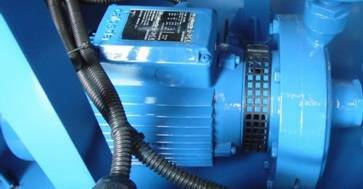 The vacuum pump VP is installed to create the necessary vacuum in the system. The vacuum pump is connected to the vacuum chamber CV by pipelines. 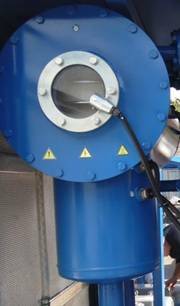 Vacuum trap R is designed to prevent oil from entering the vacuum system. It has a ball valve (K14) for oil drain. The control cabinet contains electric components required for unit operation. The cabinet features lockable doors. The panel inside contains control and communication circuits. The cabinet is equipped with control buttons and lights. cartridge filter F1 and electric valve SV1. During circulation, the output pump may stop when oil level drops below the lower level sensor To avoid that, fill the chamber with oil to the level above the lower level sensor. In this mode, all actuators can be controlled. Vacuum equipment evacuation» mode (Vac). 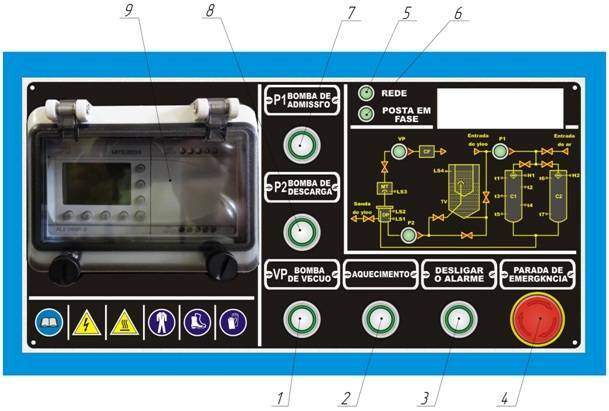 In this mode the unit evacuates air from third party equipment with the vacuum pump VP. In this mode, the VP pump may be controlled. Pumps P1, P2 and the oil heater are locked out. GlobeCore warrants the machinery supplied under this specification against defects in material and workmanship under normal use and service for a period of 12 months from date of shipment.